It might not seem a lot to ask from a loved one. But a good night’s sleep, it appears, is one of the things we find most difficult to offer each other. Millions of Britons are losing vital hours of shut-eye because of a partner’s disturbances. Not surprisingly, the number one complaint is snoring. YOU know the honeymoon is well and truly over when your partner complains because you’re not wearing pyjamas in bed. Sleeping naked is just one of the more unusual gripes that came up in a survey designed to reveal our most annoying bedtime habits. Snoring is the thing most people find irritating, though 44 per cent of people admit they do it themselves. 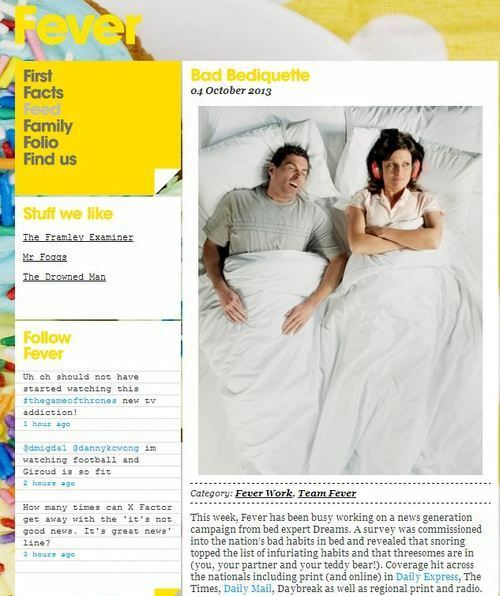 This week, Fever has been busy working on a news generation campaign from bed expert Dreams. 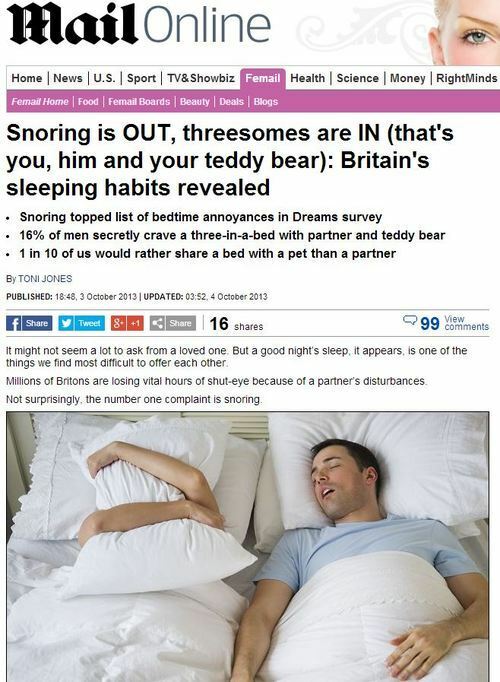 A survey was commissioned into the nation’s bad habits in bed and revealed that snoring topped the list of infuriating habits and that threesomes are in (you, your partner and your teddy bear!). Coverage hit across the nationals including print (and online) in Daily Express, The Times, Daily Mail, Daybreak as well as regional print and radio. Our Dreams spokesperson, Chris Daniel and psychologist Emma Kenny are hosting a morning of radio interviews with stations such as Sunrise, BBC Hereford and Worcester. And we’re looking forward to following up these news hits with features leveraging our case study couple, Helen and Matt! This entry was posted in Uncategorized and tagged chris daniel, daily express, daily mail, dreams, emma kenny, nathan rao, toni jones on October 7, 2013 by Michael Marshall.